A version of this article appears in the August 11/18 double issue of Aviation Week & Space Technology. New low-observable technologies, a highly reliable turbofan engine and multifunction radar are among the technologies that could be destined for an Anglo-French unmanned combat air vehicle (UCAV) in the 2030s. A two-year feasibility study, signed by defense ministers from the two countries at the Farnborough air show last month, could mark the return to an era of close cooperation between the British and French aerospace industries not seen since the development of the Concorde in the 1960s. Now more details have emerged of some of the ambitious capabilities and technologies being envisaged for the Future Combat Air System (FCAS), which both nations hope will give them a leading edge in air power and defense exports in the coming decades. The first stepping-stones toward development of a joint UCAV emerged from the Lancaster House accords signed between the two countries in late 2010. Further groundwork was laid with the feasibility study plan announced by French President Francois Hollande and British Prime Minister David Cameron during the Anglo-French conference at RAF Brize Norton, England, in January, and finally the signing last month by then-British Defense Secretary Philip Hammond and his French counterpart, Jean-Yves le Drian. Both countries face the same pressing need for a new combat aircraft in the 2030 timeframe, as the U.K. plans to retire its Typhoons and the French will retire early-model Rafales and upgraded Mirage 2000s. Studies by the French defense procurement agency, DGA, involve two models for delivering the FCAS capability. The first uses a single manned platform, a so-called Rafale NG+, a version of the Dassault fighter with significant airframe upgrades to improve its low-observability as well as increased range and updated mission system. The second option is a two-type fleet, with the manned component using a less extensively upgraded manned aircraft, a Rafale NG, with a modernized mission system only, working with a high-intensity UCAV. “In France, FCAS is not seen just as a single platform, but as a combination of several components, both manned or unmanned, and therefore we have launched many concept studies to identify the best combination—the best capabilities at the lowest life-cycle costs,” Philippe Koffi, head of future combat aeronautics at the DGA, said at a UCAV conference here July 30. Britain is exploring a comparable route. With its Typhoons potentially starting to leave the inventory around 2030, the U.K. could be left with the Lightning II as its main combat aircraft. But recent documents have revealed new thinking. In response to questions posed by the U.K. Parliamentary defense select committee, the U.K. Defense Ministry said last month that FCAS studies were looking at a number of alternatives, including additional buys of the F-35, a Typhoon life extension or an entirely new-build manned aircraft. 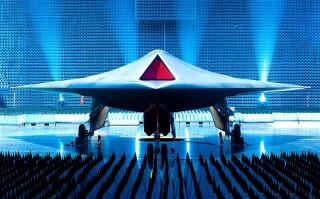 Both countries have begun investing in UCAV technology. 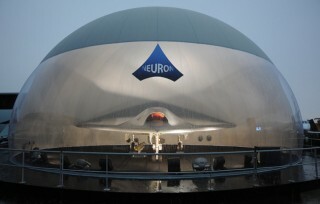 The U.K. has the highly secretive Taranis program, and France is leading development of the Neuron with several European partners. Experience from both systems will feed into the feasibility study that will begin in October. Before it begins, however, officials have been forced to make two key assumptions: One, both France and the U.K. will remain in the aerospace industry during that time period and, two, 2030 will be the date for the FCAS interim operating capability. The two countries will jointly spend £200 million ($337 million) on the two-year study. Initial proposals are expected from industry partners in the coming weeks and the first contract awards next spring. Each country will spend £100 million; £60 million will go to four core activities, such as selecting either a single leading edge or a partial fuselage for the planform. Engineers will also have to decide whether to use a derivative of a current engine, such as Snecma or Eurojet’s, or an entirely new high-bypass engine to cope with the airflows demand of the low-observable air intake. Part of this will be dependent on planned size. Neuron now has an endurance of 3 hr. with a weight of 7,000 kg (15,400 lb. ), but FCAS mission requirements demand significantly higher endurance, perhaps up to 9 or 12 hr. The program may need to go with an aircraft that has an empty weight almost three times that of the Neuron. Logically, a platform that flies further and longer also needs to carry more weaponry to allow it to engage more targets during the loitering, armed reconnaissance mission specified in the U.K. requirements. Engineers will study the potential of two different variants, one for each country’s requirements. There will also be specific studies on airspace integration, life-cycle cost analysis and development of a simulation capability. Officials from both countries have agreed on the mission sets on which the FCAS would be employed. Five missions are seen as a top priority, these include suppression and destruction of enemy air defenses (SEAD/DEAD), airfield attack, missions against strategic targets, air interdiction in a contested environment and the ability to carry out an armed reconnaissance mission, added by the U.K. For the latter, the aircraft would use its loitering capabilities to detect and engage time-sensitive targets once the more lethal and capable long-range ground-based air defense systems have been neutralized. Other missions with lower priority are anti-ship strike, close air support and defensive counter-air tasks. Information and communications systems will be updated, and engineers plan to use simulation in system development and to define how a demonstration phase could be run, either using a full-scale or sub-scale UCAV demonstrator. The development phase could begin in 2016 and may lead to a new FCAS UCAV demonstrator flying in the early 2020s. It will also see the launch of a development and manufacturing program that will further mature some Technology Readiness Level 6 capabilities. Inflight refueling is being planned for the UCAV as well, initially to allow ferrying but later to increase range and endurance. Electronic warfare systems are being considered so the UCAV can deal with pop-up threats, but as on the two current demonstrators, there will also be a high level of autonomy to reduce the reliance on data links and decrease operator workload. A large range of weapons is also envisaged for internal carriage, mainly air-to-ground munitions, such as Sagem’s AASM. Officials are hopeful that the cost per aircraft will be less than that of the current Rafale and Typhoon generation of fighters and that through-life costs will be kept lower through simulation for peacetime training. Koffi and his British counterparts are optimistic that lessons will be taken from each country’s demonstrator programs, but there is likely to be some friction on both sides about how far the sharing goes. The U.K. has been at particular pains to keep its Taranis demonstration under wraps, not even detailing the number of flights completed or naming the Woomera test site in Southern Australia where the first two flight-test phases were conducted. It appears that with the most recent trials of the low-observable capabilities of the platform, the Taranis may have a small lead over the Neuron, which is due to start flight tests in its low-observable configuration without a flight data probe in September. This will lead the way from Neuron’s flight-test phase into the UCAV demonstration phase, in which it will compete against French, Italian and Swedish radars and infra-red sensors in trials at Istres, France; Decimomannu, Sardinia; and Vidsel, Sweden, respectively. Tests of the optronic sensors will be conducted in Italy, while weapon drops of 250-kg-class weapons are planned at Vidsel. The Neuron demonstration work is expected to be completed in July 2015. Meanwhile, the U.K. plans to send Taranis back to Australia next year, for tests of the system’s radar cross section in operation.